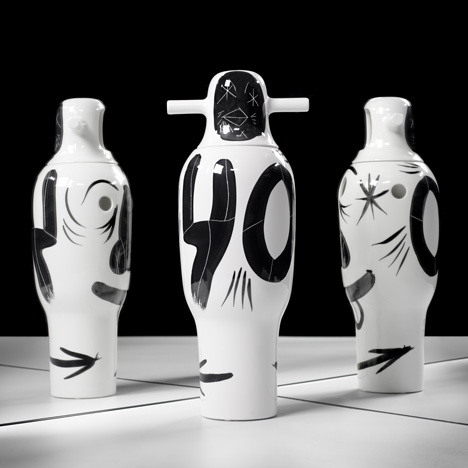 News: Spanish design brand BD Barcelona Design has commissioned designer Jaime Hayón to hand-paint 40 unique vases in celebration of its 40th birthday. "We wanted to produce a piece to celebrate our 40th anniversary and we thought Jaime was one of the best designers to do a special collection," BD Barcelona Design founder Jordi Arnau told Dezeen. "He proposed to do a hand-painted vase using a piece from the Showtime collection, hand-painted with 40 different designs." Jaime Hayón decorated each of the white porcelain vases with black enamel, incorporating a number from one to 40 into each design, Arnau explained. "He went in October to the factory in northern Italy to paint them. This is the only product we don't produce in Spain." "Jaime is an artist who works between art and design, and this has more and more demand in the world," continued Arnau. "BD is well known for its historic collaborations with artists like Salvador Dali so this made sense for us." BD Barcelona Design was the first design brand in Spain and was established at a time when Spain was isolated from the rest of the world under the Franco dictatorship. The company began producing and importing classic pieces by designers including Antoni Gaudi and Charles Rennie Mackintosh as well as collaborating with figures including Salvador Dali. In recent years the brand has collaborated with designers including Konstantin Grcic, Doshi Levien and NHDRO. See all our stories about products from BD Barcelona Design. Hayón created his first project for BD Barcelona Design - a mail box - in 2003 while working as head of the research department at Benetton's creative research centre Fabrica in Italy. A year later he returned to Barcelona and set up his own studio, designing the Showtime vases for BD Barcelona Design alongside projects for clients including Camper, Lladró and Bisazza. See all our stories about design by Jaime Hayón.